The Buddha statue at Kuensel Phodrang in Thimphu was consecrated, yesterday, after 10 years since the initial works first began. 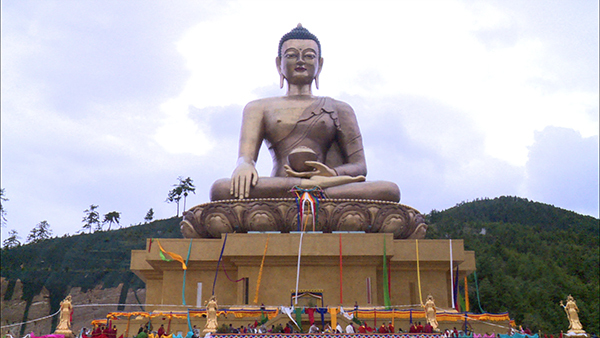 The 201-feet tall Buddha Dordenma is one of the largest statues in the world. “The main reason for building such a Buddha Statue is because we are a Buddhist country. It is like an identity for being a religious country. Buddha is the first preacher to spread Buddhism in the world,” said Laytshog Lopen, Sangay Dorji. The statue will also house over 100,000 smaller statues made up of Bronze and gilded in gold. Approved by His Majesty the Fourth King and His Holiness the Je Khenpo, the project was initiated by Lam Tshering Wangdi. A Singaporean Businessman, Peter Teo is the main sponsor of the project. The statue is expected to be a major pilgrimage centre and a focal point for Buddhists all over the world to converge, practice, meditate, and retreat. It is expected to take another two years for the project to be fully completed.